As with many things in life (and as someone in my workplace has just remarked to me) when one door closes another often opens, and although the door has closed (well, shut a little bit) on Star Wars, at least for my regular Sunday group, although I’ll still be running one-shots and trilogies in a galaxy far, far away under the auspices of the Tides of Change roleplaying community for as long as people want to keep playing them, we’ve decided to try something different, a D&D 5E campaign. Now you might laugh and say “But surely John a D&D campaign is the most common RPG”, and well it might be, however, it isn’t for me, this will be the first D&D game that I’ve run for years, and certainly the first 5E game I have run (having only played the game once before). The campaign is nowhere near ready to go yet because I’ve a lot of reading and rules-learning to do first, but I’ve gathered together the remnants of my regular group (Jenny, Mathew and Thashif) along with two additional excellent RPers (Rob Davis and Sean Connors) to join me in this attempt. Run a game that was set in a standard pseudo-medieval campaign world. Make it interesting through the personalities of the NPCs and history rather than gimmicks. Use a lot of so-called “old school” elements such as dungeons and hex-mapping/exploration but in an interesting manner. My name’s Erin—thanks for visiting The Welsh Piper. I started this site to help RPG players and game masters make the best use of their available gaming time, which always seems too short. I cut my roleplaying teeth on the Moldvay Basic D&D boxed set in the early ’80s. It’s far less complex than today’s D&D, but after more than 25 years of playing, designing, and writing RPG systems, its “rules-lite” approach continues to have appeal. For the busy gamer, who (like me) needs to balance the hobby with the real life responsibilities of family, work, and school, “rules-lite” is the way to go. The Welsh Piper shares what I’ve learned so you can spend less time preparing for your game and more time playing it. Combining this with the excellent mapping software Hexographer by Joe Wetzel (who was kind enough to resend me my activation code when I lost it due to computer issues) I was able to create the small area where our game is going to start with ease, an area surrounding by forests, hills and mountains where the the remnants of an ancient coastal city now exist as three seperate villages named after the three people who lead the locals to throw off the shackles of slavery and a fortress that is owned by one of their descendants and watches the area for any sign of their ex-masters return. 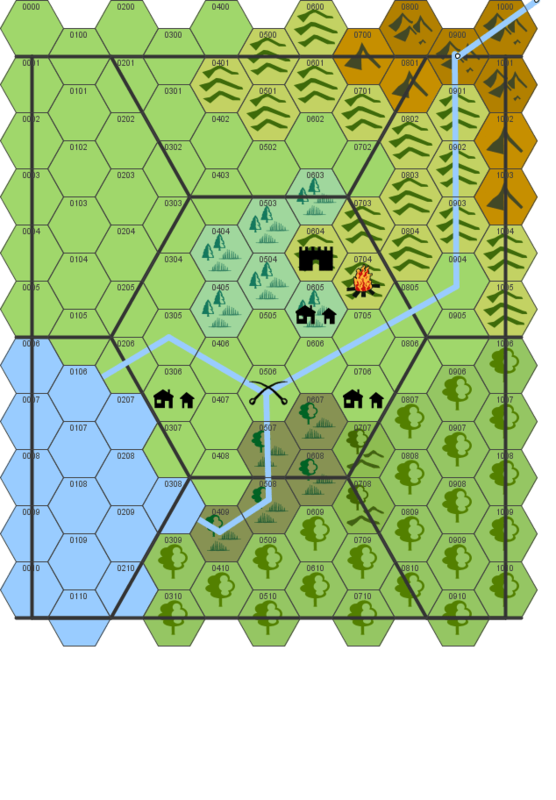 This entry was posted in Uncategorized and tagged 5E, 5th Edition, D&D, Gith, hex mapping, Hexographer, The Welsh Piper, Three Brothers by John Large. Bookmark the permalink. Best of luck to you and I hope it goes smoothly as well. Sounds like we have some similarities in gaming and I like Hexographer a lot. Thanks very much, I’ve been running more Fate and Star Wars recently but my regular group fancied something a bit different and, after a conversation with a couple of long-time D&D players I know, I decided to try and run a traditional fantasy setting, since I think it’ll be challenging to make it interesting when the tropes of the genre are so well known. I’m certainly looking forward to playing!